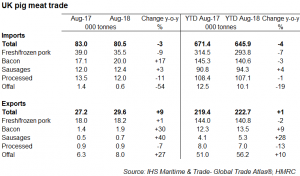 Fresh/frozen pork imports were reportedly 9% lower than in August 2017, at just under 35,500 tonnes. 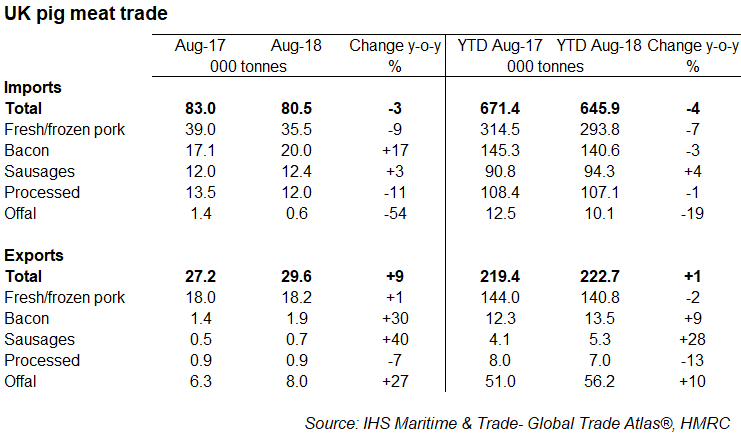 This follows two months when imports had been much higher, though is in line with the overall trend for the year so far, which shows pork imports have been 7% below last year. EU pig prices were rising in August, reducing the price competitiveness of EU product compared to British pork, which may have helped deter import levels. The average price of pork that wasimported was 11% lower than a year earlier, meaning the value of UK pork imports fell 19% to £66.5 million. Only Ireland and Poland bucked the overall trend and sent noticeably more pork to the UK during the month. Shipments from the Netherlands recorded a particularly strong decline of nearly 50%, while volumes from France were down over 40% year-on-year. An 8% drop in imports from Denmark, the UK’s largest pork supplier, was also recorded. More recently, EU pig prices have dropped back sharply, with pork from Belgium particularly cheap due to the discovery of African Swine Fever. This could mean import pressure has been higher again in recent weeks. It was a similar picture for processed ham imports, with both volume and value falling on August 2017. On the other hand, bacon imports were higher during the month, up 17% year-on-year. Lower Dutch shipments were offset by higher volumes from most other suppliers. The value of this trade was still 10% lower though, at £40.4 million. Sausage shipments were also slightly higher than year earlier levels, thanks to strong shipments from Ireland and Poland. After a weaker few months, UK pork exports were 1% up on the year in August, at 18,200 tonnes. Rising EU pig prices at the time may have helped boost sales to Europe, with volumes also up 1% on the same month last year. Growth was recorded to Germany and the Netherlands in particular. Exports to the US were also well above August 2017, although trade outside of the EU was stable overall due to lower shipments to China. While average pork export prices were lower than last year, the fall was not as great as for imports, so export value was only down 4% at £23.1 million. Exports of bacon and sausages, while being much smaller in volume, were much higher in August. Offal exports also rose strongly, with growth from both EU and non-EU markets. There was notable growth in volumes to China of nearly 40% year-on-year, and trade with Hong-Kong also increased modestly. The US is traditionally the largest offal supplier to China, but with prohibitive tariffs now in place, other suppliers have been able to gain market share.